Fighting for a return to traditional morals and principles and maybe enlightening a few people along the way! 1. Do you honestly believe that Republicans want to take away your right to vote? The very idea that Republicans seek to suppress or eliminate the black vote is absurd to reasonable people, yet that's what Barack Obama, Joe Biden and other prominent Democrats were saying publicly, and apparently the more gullible folks believed them. Using fear and resentment, the Obama campaign shamelessly riled up black voters to ensure their turnout, a tactic that is unconscionable. 2. Do you really believe that everyone who opposes President Obama does so because of racism? Racism, the "R word", is thrown about freely by Democrats in regard to anyone who doesn't agree with Obama. Are there racists out here who don't like the president because of his skin color? Certainly - I've seen examples of it firsthand. However, the majority of people who oppose this president do so because of his liberal policies, not because of his racial background. It's just so easy to throw out the racism charge instead of engaging in a rational debate, isn't it? 3. Why aren't you angry about the unholy alliance between Democrats and the teachers' unions that doom many black children to failure and poverty? Many urban children are stuck in schools that are failing to provide a decent education. Republicans support charter schools and school vouchers that would give disadvantaged children the option of attending the school of their choice, thus enabling them to get a high quality education. Democrats, beholden to the teachers' unions, oppose school vouchers and charter schools. These same Democrats send their own children to exclusive private schools, yet want to deny inner city children the same opportunity. 4. For decades, blacks have been voting almost exclusively for Democrats, yet more and more black people are falling into poverty. What are you getting for your vote? Let's be brutally frank here: Democrats have been bribing people to vote for them with various social programs. Since the 1960s, the government's welfare policies have been been decimating black families and keeping people mired in poverty and misery. Furthermore, Democrats have a vested interest in keeping people poor and powerless so they can continue to offer them "goodies" in exchange for their votes. How does it feel to know your vote is being bought and you're being taken for granted? 5. Although you vilify rich people, don't you really want to be wealthy too? There's nothing wrong with seeking comfort and security; it's human nature to want those things. The harsh reality is that the only way to achieve financial stability is through a good education or vocational training and hard work. We must find a way to offer the opportunities that lead to success to as many people as possible, but make no mistake about it: ultimately, traveling the road to financial security requires taking personal responsibility for your life. We need a "safety net" for those who truly are unable to take care of themselves and lack family support, but being dependent on government puts you in a very vulnerable position, and as long as you are dependent on government, you will be poor, not prosperous. 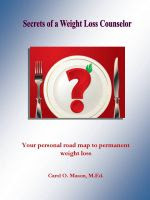 Your personal plan for permanent weight loss! Should Conservatives Soften Their Views? I live in Richmond, Texas with my husband, John, dogs Dusty and Doc, and our cat, Ferris. I am an amateur dressage rider on my horse Mack.